Not taken by a hungry fox in the night but slaughtered one morning by a dog. A big one by the looks. There is large hole through the chicken wire at the ground level of the poulailler. Sabbatical Man cleaned up the worst of the evidence but trails of feathers in the nut orchard tell a miserable tale of terror and entrapment, escape, pursuit and capture. The boys are stunned and Sabbatical Man is angry. “Bloody dog,” he muttered, as he packed up the rubbish bags the canine intruder had also sunk its teeth into. Yes, of course I am sad. Fox jokes aside (though I still long to meet one) I tried not to get attached because I knew it would end badly. The chickens’ best case scenario was surviving until we leave, only to trade their dreamy, free-range, pampered life for one back in a shed with 100 other chickens. That might have been worse than a quick death. The thing I liked about them was their rounded and fluffy rear ends that made a lovely soft “shush” sound when you tapped them ever so lightly with a plastic rake. They had a way of standing on one leg and freezing when they were caught trespassing as if to say: “I am not actually completely in your lounge because only half of my legs are on the ground,” or maybe: “If I stand on one leg I am completely invisible”. 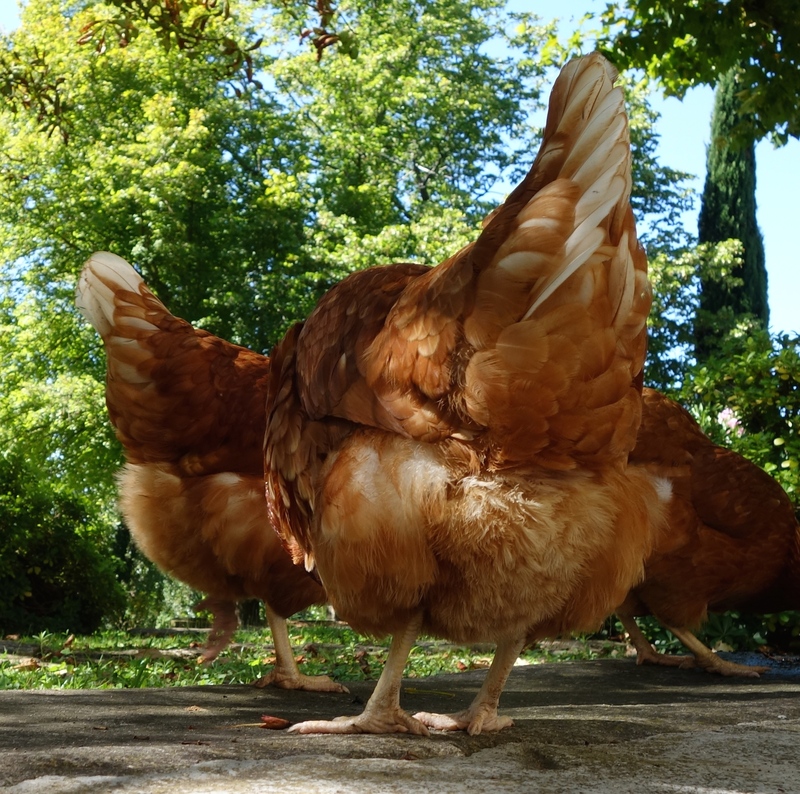 There was nothing funnier than watching them spread their elbows and lift their skirts high to sprint after a child offering yoghurt or grapes or corn – their feathery little backsides lurching from side to side across the paddock. Don’t tell Sabbatical Man but one day when he was away I sliced off more Roquefort than I could eat and, rather than wrap up a couple of mouthfuls of possibly the world’s most expensive cheese, I thought I’d discreetly give it to the chickens, who like cheese of any sort. “The chickens love the Roquefort mum!” yelled Medium. 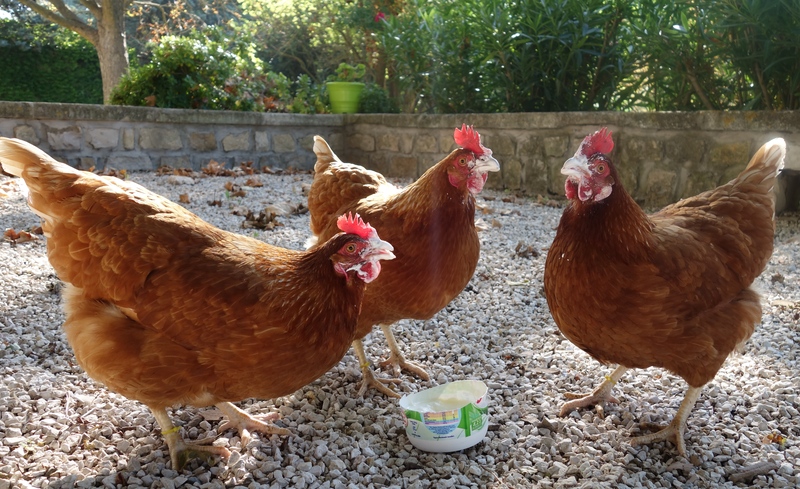 They loved yoghurt too. Sabbatical Man called me outside to watch the show when he fed them yoghurt in a bowl – you try cleaning yoghurt off your beak without hands. Very entertaining. A little game I could not help playing with them was to call them over to the chicken enclosure and tip food inside. Then I would watch to see how many of them would fail to walk through the open gate but stop at the fence and fix an eye on the food on the other side of the wire, utterly bewildered and disappointed. Clueless. I’m not much of a torturer. I could only ever stand it for 15 seconds before I shooed them toward the entrance. Again. They did their job well. They recycled our food scraps and reliably gave us at least an egg each a day – sometimes double-yolkers – and I am grateful for that. They gave Medium the chance to shine as a chicken-handler. So many nights when we had forgotten to lock them up we would hear Medium tiptoe downstairs, grab a torch and call out: “I forgot to put the chickens away,” waving off offers of company or assistance. Large and Small carried them around, helped harvest eggs, learned to cook omelettes without assistance, experimented to find out which foods they enjoyed the most. 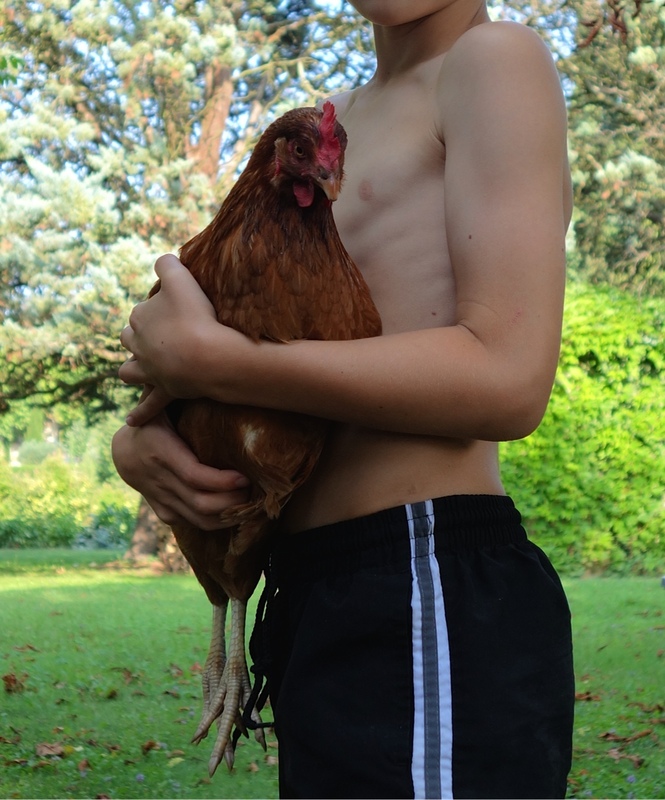 Every French person who set foot on the property marvelled at how tame our chickens were. Sure, for the first week they had been jittery, wary of humans, jealously guarding their food, one of them bullying the others. As time went on and the food supply never dwindled, the space never closed in, they chilled out – slowing down the pace, taking afternoon naps, leisurely dust baths and showing signs of camaraderie rather than competition. If Medium or Sabbatical Man called, they came running. We’d often find Caramael “bok-bok-bokking” at the door and call: “Medium! Your girlfriend’s at the door!” and she did seem to be calling him. We actually thought we had lost them a few days ago when they didn’t come back after a long foraging mission. “That’s the way it is with birds. If they don’t come back at night you will never see them again,” Sabbatical Man said darkly. I wasn’t convinced and, sure enough, the next day we were stopped in our driveway by a beaming neighbour who had found our chickens near his house and kept them overnight in his poulailler. He returned the chooks later and they spent the next three days – their last, as it turned out – close to the house, taking dust baths in the boules court, feasting on snails after a heavy rainfall, settling to sleep under the patio table. I let them be. I was surprised to discover how relieved I was – for the children, obviously. So I texted the news to Large at school. “Non! Pas de tout de tout!” she said. “C’est une belle histoire!” [“Not at all! It’s a beautiful story!”] I found out later that she rushed straight to the boys’ classroom to share the good news, charmed by the happy ending that only lasted three days. As I have said, the children are pragmatists. Later, when I took some baking to the neighbours to thank them for returning our soon-to-be-dead-anyway chickens, Medium and I were met by three generations of the only neighbours we hadn’t yet met. There was a very agreeable standard of piss-taking going on about our pampered poules when one of the monsieurs in his sixties nodded at Medium. “Does he speak French?” he asked. “A little,” I told him. He said something in rapid-fire Provençal French. “What did he say to you?” I asked on the way home. That’s Medium for you. Born to be a farmer. Sabbatical Man though. Not sure about him. I offered to make him lunch earlier today and, considering the shortage of any bread in the house, suggested an omelette. I think he thought I was being unkind – which I really, really wasn’t. “I don’t feel like omelette,” he said glumly. Oh no! That’s horrible. Will you get some more? Small is already asking; Medium says definitely no because there will never be another Caramel. SM is not sure. We’ll see. Oh I have been entertained yet again, from your Awatuna standpoint you are such a farm girl !!! Hi Marie:) yes it shines in him! I have discovered that farm life agrees with me as long as a) I don’t have to do the work and b) I live within 15 minutes of the city. Being in France adds to the charm somewhat! They were such a part of the family. Everyone loved them except a certain person who tried to spray them with the hose.They will live on in our memories and photos. Ha – well don’t tell the kids but it is possible that I sprayed one of them the day before the disappeared for the night. It was only a teaspoon – but I did wonder if they had staged a walk-out in response. How’s the jetlag? Feel bad for the boys! You better teach me how to pronounce “poulailler”. Maybe chooks in Mt Eden when you return?